Knickernappies Featured Retailer of the Week is...TerraMade of Sioux Falls, SD! Today's Retailer of the Week is TerraMade of Sioux Falls, SD! Read today's post and get to know TerraMade and it's owners a little better. First tell us a little about your family, if you have little ones in cloth diapers, where you're located, etc.-TerraMade is owned and operated by Cam and Terra Anderson and their two little ones- both in cloth, ages 1 & 3. We are located in Sioux Falls, SD. How did you get started cloth diapering and what made you decide to open your own business?We got started with cloth diapering after not being able to find a good diaper option for our heavy wetting son with sensitive skin. We started out with one diaper just for nighttime, then five more…and then a few more…and then our daughter came along, and she has been exclusively in cloth with a very large diaper stash! We were hooked after that first diaper. We decided to open TerraMade Products because there was a local need for products for children and adults with sensitivities and allergies. We started with soaps, but adding diapers to the line-up just seemed logical. 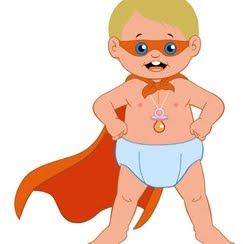 In fact, we love cloth diapering so much that we will soon be celebrating the grand opening of our new venture, Take A Load Off Diaper Service. What do you like best about being involved in the Cloth Diaper Industry? We love knowing that we are helping other children by providing a healthy option for them. The look on the faces of potential customers is priceless when we show them a diaper, knowing that they are expecting prefolds, pins, and plastic pants. We are a very green family, and take our environmental responsibilities very seriously. What are your favorite Knickernappies products and why? We love the new one-sized diapers. Compared to other one sized diapers we had tried in the past, these are the only diapers out children did not outgrow the rise. Of course the Loopy-Dos and Super-Dos are a must with heavy wetters! We also love the Doorknob Diaper Pail, and the Baby Bum Drops. Special Offer: Use Code Knicker10 at checkout and Save 10% off your order! Like TerraMade and want to stay connected with them? Follow them on Twitter and become their Fan on FaceBook!